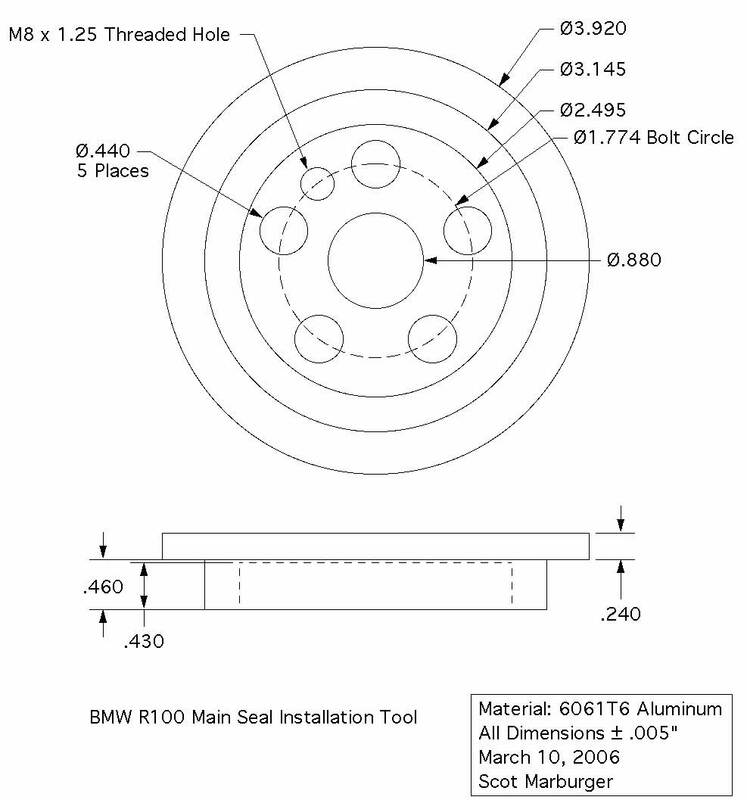 The main seal at the back of the R100 motor is large (more than three inches on the outside diameter) and narrow, making installation a challenge without the proper tool. When removing the transmission for a main shaft circlip upgrade, I noticed that the main seal that I'd installed with a drift and hammer was leaking between the engine case and the OD of the seal. More than likely this was do to bending the seal body with the drift, since it's almost impossible to keep the seal square to the bore all the way around using that method. While I was at Ted Porter's BMW shop I noticed a main seal installation tool laying on his bench, and asked if I could copy some dimensions from it. Ted readily agreed, and even offered to read the dimensions off as I wrote them down. Unfortunately, his eyeballs are as bad as mine, and it took both of us to read the caliper! Regardless, on my return home I sat down at the computer and knocked out a drawing, simplified from the driver on Ted's bench to make fabrication in my small shop a bit easier. You can jump to a larger version by clicking on the thumbnail at left. I chose to make my driver from some aluminum plate I had laying around, which meant sawing out a square and then rounding it up while it was held in a 4 jaw chuck. That's a lot of work but it was faster than running around looking for three and a half inch bar stock, then getting nailed by minimum order charges. For me the most challenging part of the job was getting the five bolt holes properly located in the plate. I was able to find some information on the web that let me calculate a bolt circle, but without a dividing head and a milling machine the information didn't do me much good.